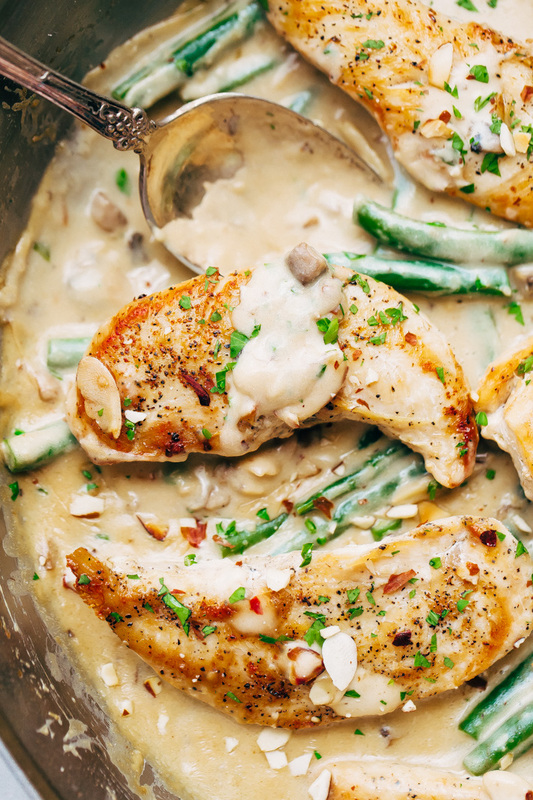 Say hello to Creamy Almond Chicken! This meal comes complete with protein, veggies and an irresistible cream sauce that you can drizzle over rice. Use chicken breasts or boneless, skinless chicken thighs – either way, I can promise it’s one delicious meal! This recipe is sponsored by our friends at ALDI . 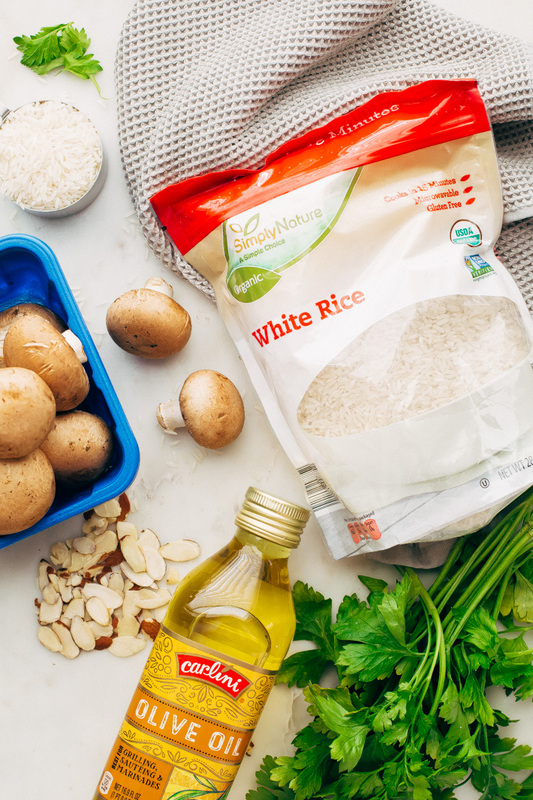 We’re using their award-winning* SimplyNature Organic Quick Cook Rice to serve with today’s chicken recipe! 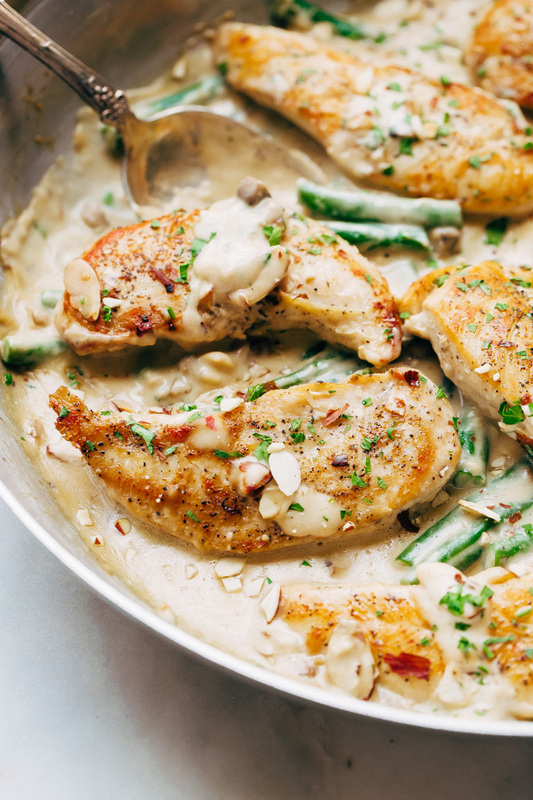 Creamy Almond Chicken. 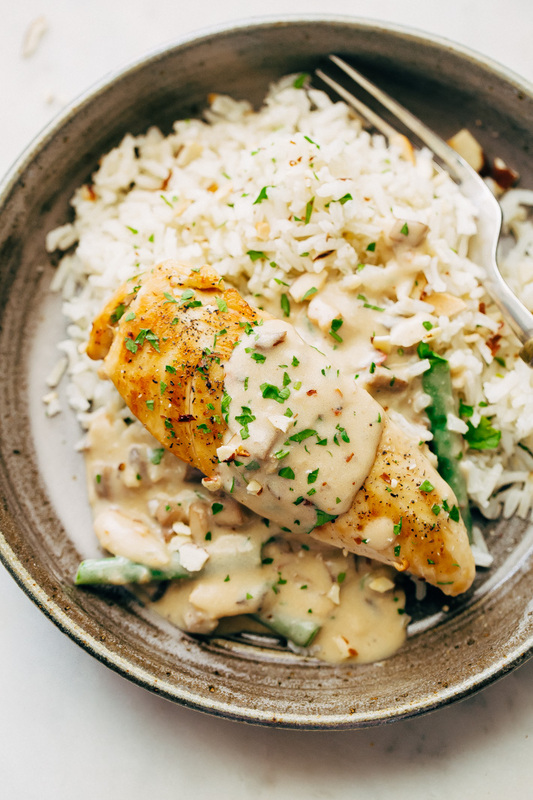 Guys, it’s the kind of meal that’s sure to become an instant hit if you like chicken and you like a warm cream sauce, and you like to drizzle that cream sauce all over a little mound of fluffy, garlicky rice. I can’t contain the excitement. The best way to describe it – a green bean casserole meets your favorite garlicky skillet chicken, and it is just a tad bit more perfect when we pair it with homemade rice pilaf. This is Summer 2017s newest, most flavorful chicken dinner. It starts with seared chicken breasts and homemade mushroom cream sauce that’s made entirely from scratch in the same pan as the chicken, so the flavors shine brightly through the entire dish. Big bonus: what you won’t find in this recipe is ‘cream of’ this or that. It’s all made from scratch using straightforward ingredients that you can pick up for less at your ALDI store, and it’s ready to serve in the ballpark of 30 minutes. What else could you want from a meal? Creamy Almond Chicken with Rice is the epitome of weeknight-friendly comfort food. 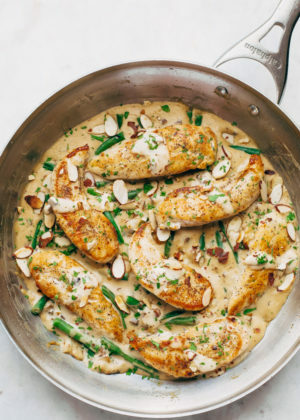 Before we jump into today’s Creamy Almond Chicken recipe, I want to talk to you about WHERE I go to get all the ingredients and WHY I like to shop there, and it’s all starts with one word – ALDI. I love all the ways ALDI is so good to us. To kick it off: affordability without compromising quality. Friends, this is key. It’s easy to drop prices and provide subpar products, but to provide high-quality ingredients that are free of artificial colors/flavors, don’t contain MSG or hydrogenated oils and still keep the dollars in your wallet, that takes extreme dedication. Before you’ve set foot inside the store, ALDI puts its customers first, and I’m going to tell you, there’s nothing I love more than a store that spoils me. With that said, it should come as no surprise that ALDI is one of America’s favorite grocery stores**. What I love most about it is that they listen and deliver to my (wanna-be) hipster, millennial ways. ALDI is redesigning its stores in a beautiful, modern, and sleek way, and chances are a store near you has been redesigned, too. This includes the usage of natural lighting, so it’s bright inside. The store is built from recycled materials, has energy-saving refrigeration, and personally, as a consumer, I love the fact that a store puts that much emphasis on being environmentally friendly. ALDI, you not only make my tummy happy but also my heart. Now let’s get to the food; the real reason we get together. ALDI offers products that have won numerous awards. We’re using SimplyNature Organic Quick Cook Rice (which comes in both the brown and white variety) to serve with today’s Creamy Almond Chicken recipe, and it has been voted 2017 Best New Product in the rice category*. What’s also great is that you can prepare the rice on the stove OR the microwave in 20 minutes. LOOOOVE it. All of this sounds a little too good to be true, right? 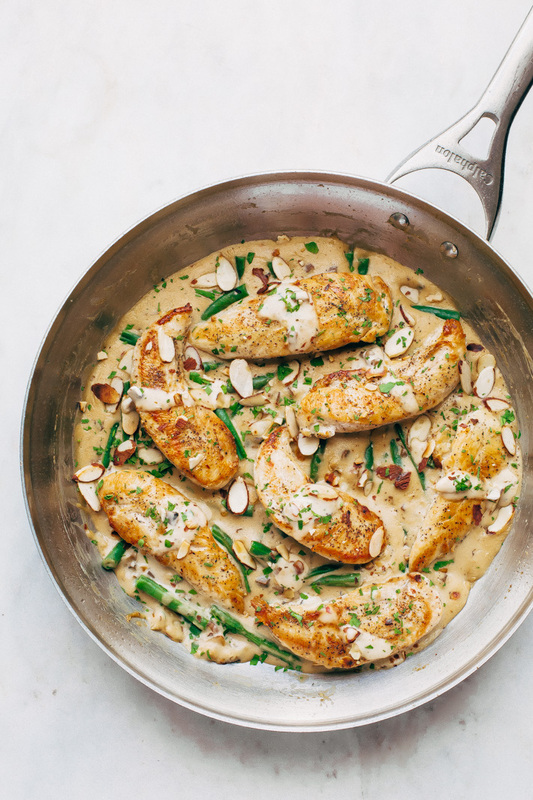 And now, the moment we’ve all been waiting for: our Creamy Almond Chicken Recipe. It starts with the SimplyNature Organic Quick Cook Rice. We’ll sauté it in just a little bit of oil and then let it simmer in chicken broth, so that it’s all about that flavah! While the rice cooks, we’ll get started on the Creamy Almond Chicken. Season your chicken — a little salt, pepper, and garlic powder and cook it off. When you cook the chicken in the same pan as the sauce, those flavors transfer right over and create such great depth to the whole dish. Good cooking is all about layering those flavors. Fellow food lovers, it’s our secret. I won’t tell if you won’t! And all the ingredients you need are available at your local ALDI store. So grab a quarter, and go check it out! *Results based the 2017 BrandSpark Best New Product Awards survey and real user feedback from Shopper Army. Rice Pilaf: Heat the oil in a medium saucepan over medium heat. Add the rice and garlic and let toast for 2 minutes. When the rice is toasted and the garlic is fragrant, add 2 cups of chicken broth and let it come to a boil, lower the heat to low, cover and let the rice cook for 15-20 minutes or until the water dries up. While the rice is cooking, start on the chicken. Let stand for 5 minutes before fluffing the rice with a fork. Cook the chicken: Season the chicken with a generous sprinkle of salt, pepper, and 1/4 teaspoon of garlic powder. Heat the butter in a large skillet over medium high heat. Add the chicken and let cook all the way through, about 4-12 minutes depending on thickness. While the chicken is cooking, zap the green beans in the microwave for 30-45 seconds. When the chicken is cooked, remove to a plate. Make the sauce: Add the mushrooms to the remaining butter and sauté them for 1-2 minutes or until they soften. Sprinkle the flour and the remaining 1/4 teaspoon of garlic powder, stir to coat and let cook for 1 minute. Pour in 1 1/4 cup of chicken broth and the sour cream, use a whisk to help break up any of the flavor bits that may be stuck to the pan. Let the sauce come to a simmer and thicken. It should thicken enough to coat the back of a spoon in about 1-3 minutes, if you prefer your sauce slightly thinner, adjust with the remaining 1/4 cup of broth. Once the broth has reached your desired consistency, taste and adjust seasonings to preference. Add the chicken and beans into the skillet and drizzle with sauce. Sprinkle with the toasted almonds and serve immediately with the rice pilaf. The sauce will thicken as it sits, so if you aren’t serving this right away, you may need additional broth or water to thin. If you can’t find toasted almonds, buy sliced almonds (such as Southern Grove) and toast them in a bare, hot skillet for 1-2 minutes tossing them as required. You can do this before starting on the chicken in the same skillet. My spicy people – try adding a pinch of red pepper flakes (or more) when the sauce is simmering – soo good! A big thank you to our friends at ALDI  for sponsoring this post! We love working with companies that make good, wholesome products! This is a sponsored conversation written by me on behalf of ALDI. All opinions expressed are my own.